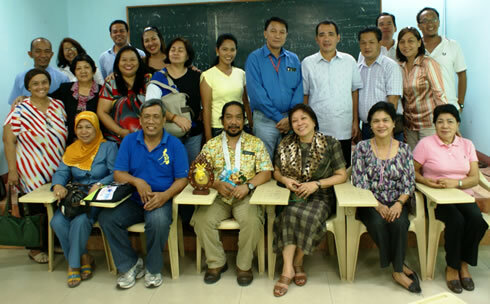 Western Mindanao State University-Office of the President and the College of Social Sciences held a seminar on The Role of the University in the Peace Process. Malaysian Associate Professor Dr. Kamarulzaman Askandar was the event’s resource speaker. The seminar was participated in by the faculty members of the College of Social Sciences last July 15 at the College of Law building of the university. For a background, Assoc. Prof. Dr. Kamarulzaman Askandar is the coordinator of Research and Education for Peace, University Sains Malaysia (REP-USM) and at the same time the Regional Coordinator of (Southeast Asian Conflict Studies Networks) SEACSN. The latter is a network of individuals and institutions involved in peace and conflict resolution research and practice. He is a lecturer of Political Science in Universiti Sains Malaysia in Penang, Malaysia, and a known figure in conflict resolution. In the need to respond to conflict resolution issues, the university opened its arms to this kind of advocacy and awareness discussion. The seminar intended to promote responsiveness to the need for early conflict prevention and sorting out means to a peaceful conflict resolution. In the belief that in the grassroots level of the university, the academe by far serves as a potential in peace building and conflict transformation process. The seminar also emphasized the limitations and the posture of an academic institution in undertaking and strengthening any peace building work in this part of the country.